Just the words make the tongue tingle to the tart lime taste. The limes this great American pie are made from are small key limes. Because the key lime juice is more yellow than that of the more common Persian lime, key lime pie has a yellow filling, unless the cook adds green food coloring. While purists frown upon adding food coloring, either way the taste is something to remember. Historically, the original version of this pie was made with sweetened condensed milk, and often was not cooked. To ensure food safety, the filling for this recipe cooks in just three minutes after coming to a boil. Want to make a special dessert? Try this modern version of an American favorite. This pie uses real limes, instead of reconstituted lime juice! In a medium saucepan, combine 1 1/2 cups of sugar with the cornstarch and salt. Add the lime juice, the cold water, and the egg yolks; mix well. Add butter to the mixture and gradually add the boiling water, stirring constantly. Stirring constantly, cook for 3 minutes. Stir in the lime peel. If a greener color is desired, add a few drops of green food coloring. Remove mixture from heat and cool for 20 minutes. Using the bowl of your electric stand mixer, beat egg whites on high until frothy. Add the cream of tartar and continue to whip until stiff peaks form. Pour the lime mixture into the prepared pastry shell. 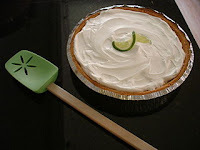 Gently pile the meringue on the lime filling and smooth to cover the filling. Carefully seal the meringue to the edge of the pastry shell to prevent shrinkage of the meringue. Cool completely before cutting. This recipe makes 1 pie.